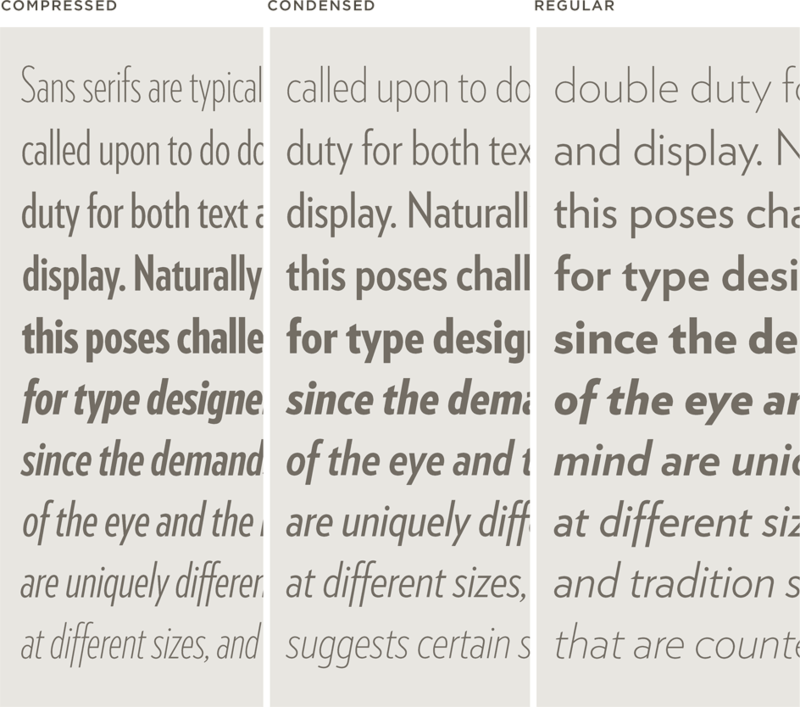 Verlag Font Features: Three Widths | Hoefler & Co.
Three widths, five weights, thirty styles. Verlag’s family is unusually complete for a geometric sans, featuring not only a parallel range of weights in three different widths, but matching italics for every style. At their worst, geometric sans serifs are in danger of looking sterile, and even the best of these designs can sometimes look unnatural. A design that too rigidly clings to its geometric agenda often faces the additional problem that its family is too small — or too unbalanced — to be useful. The typeface whose capital A is determined to be pointy at all costs will simply have a hard time adapting to different proportions: its condensed will suffer, its compressed more so, and a black compressed will be out of the question. These absences truly limit the font’s value. Other kinds of sans serifs can take planned excursions from their itineraries in order to work in extreme weights or widths, but these digressions are always evident in a geometric. Verlag addresses the problem by moving the goalpost: even at its most Apollonian, its visual vocabulary includes subtle asymmetries and complex curves that shift the emphasis from looking like circles and triangles to looking like letters. Save $100.00 when you buy the complete Verlag collection! Three Widths. Verlag comes in three widths: a regular width for text, a Condensed for close quarters, and a Compressed for headlines. All fifteen romans have matching italics. Contextual Figures. Verlag reconciles the modernity of “lining figures” with the font’s small x-height by offering two sets of numbers, with matching punctuation. Language Support. Verlag features our Latin-X™ character set, covering more than 140 languages throughout the world — including all of Central Europe.